A nice miniature in which there are two main prismatic crystals with excellent terminations of acute pyramids. All crystals are very sharp and bright. Previously in the Thomas Moore collection. Group of crystals of very well defined faces and edges and very acute terminations. It is on a matrix of a small group of white crystals of Orthoclase. 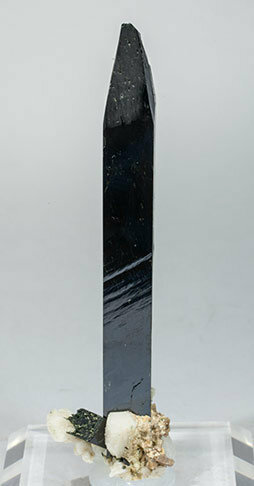 Very elongated single Aegirine crystal with a very acute pyramidal termination, very bright and on matrix, with Orthoclase and small creamy Zircon crystals. 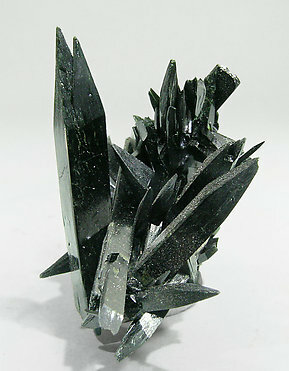 Aggregate of very elongated Aegirine crystals that are doubly terminated, very bright and with Quartz crystals. The sample has very unusual esthetic quality. 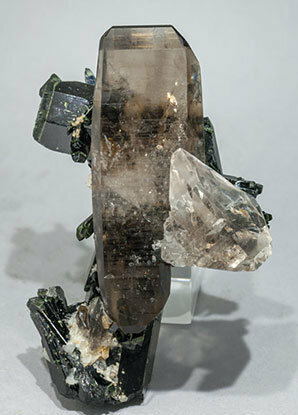 Very curious doubly terminated smoky Quartz crystals, one of them clearly dominant, flattened and with very sharp and well defined faces and edges. The Quartz is with Aegirine crystals, some of them doubly terminated, and small Orthoclase and Zircon crystals. 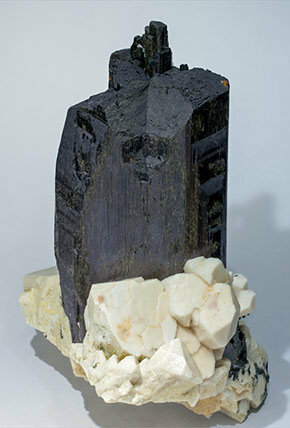 Doubly terminated crystal of Aegirine with pyramidal faces on one of the terminations and polycrystalline growth on the opposite end. 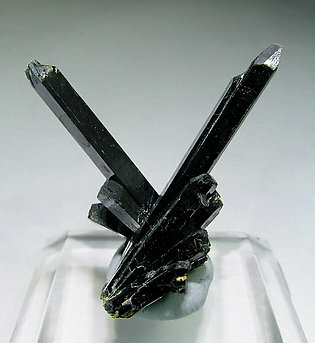 It’s on a doubly terminated crystal of Quartz, colorless and transparent in the prism and neatly deep smoky on the terminations, one of them with a group of small crystals of Aegirine. 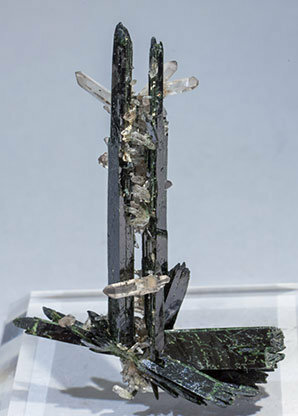 A fan group of very elongated prismatic crystals with complex terminations, very bright and with a group of white Feldspar crystals (probably Microcline) partially covered by small doubly terminated crystals of Zircon on the base of the sample. For their luster and size of crystals this is an exceptional piece. 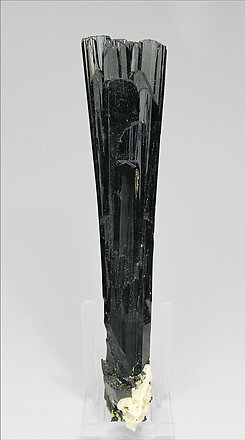 A considerably large Aegirine crystal with very well defined faces and edges, with good terminations and a unique characteristic, a very well defined and visible frontal twin, not previously noted at Mount Malosa, as far as we know. 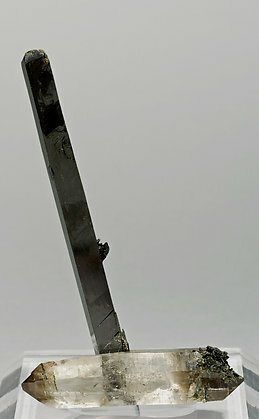 The twinned crystal is on a matrix of white feldspar crystals and its back is partially coated by small Zircon crystals, many of them doubly terminated.